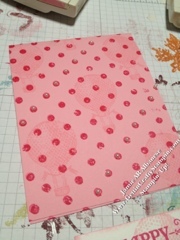 Getting Crafty with Jamie: Your Amazing in Pink Polka Dots! Your Amazing in Pink Polka Dots! My daughter has a new lil friend in her class this year, Ella, and we missed her Cinderella Swim Party :(. I couldn't resist getting a sweet lil present and making this card for her new lil friend! My Genevieve picked out her favorite color for the base, Pretty In Pink! The Color Coach suggested the Monochromatic sister in Melon Mambo. I nabbed my Distressed Dots background stamp and with Melon Mambo stamped the card base. I wanted to make it extra girly and I couldn't resist adding these pearls in two of the Dots lines. I could have done the whole page but it would have almost taken away from the fun texture of the Distressed Dots, don't you think? 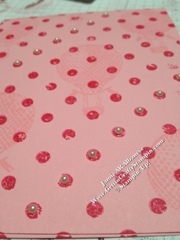 I then stamped the hot air balloons in Pretty In Pink ink. It creates a subtle distressed addition to the background. I like that the balloon has distressed dots in it, too!! With Melon Mambo ink I stamped on Whisper White paper the Happy Birthday sentiment from that Your Amazing stamp set and with Pretty In Pink I stamped the distressed hot air balloon from that same set across/behind the sentiment. With our Apothecary Accents Framelets and my Big Shot I punched out this great shape. I then used two of the larger adhesive backed pearls to the ends. It makes for an easy coordination. I then took a sponge to the Pretty In Pink ink and distressed the edges with this color. It softens an yet defines the edges of this shaped sentiment. 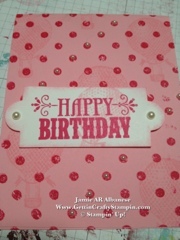 With Stampin' Dimensional adhesive it floats on the card and ties into the pearls that are in the dots! A fun and girly card... It is ideal for a 6 year olds birthday! I hope you feel fashionably vintage an polka dotty! I love this StampinUpLNStampers challenge. ! Here with the dots and lines it sooo takes on the Challenge 191! What a wonderful card. I love all of it. The polka dots are perfect for this challenge. Thanks for playing with LNS this week. What a cute card. So very easy but wonderful. Thanks for playing this week at LNS!